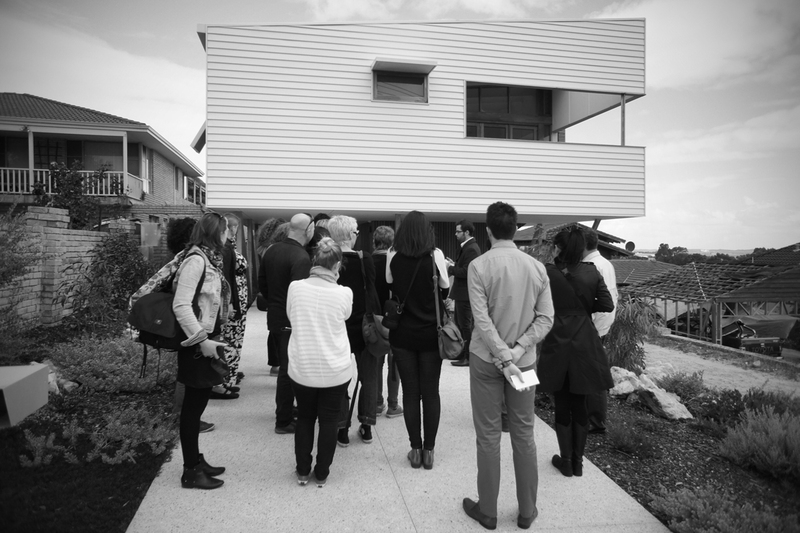 A series of fringe events around the national architecture conference, Making 2014, were conducted last week, providing visitors to Perth an opportunity to see more of the city than the conference centre and their hotel. 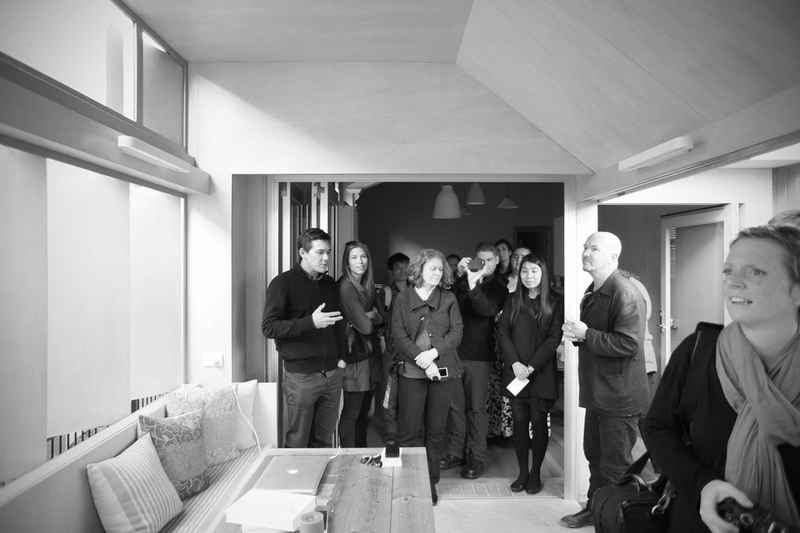 One such event, held in conjunction with Open House Perth, was a tour of three recently completed houses, two by David Barr Architect and one by Philip Stejskal Architecture. Having been slightly ambitious when booking this tour, we had to rush to its starting point in the city directly from the airport, lunch missed and luggage in tow. Once on board the shuttle bus however, we were treated to a gentle drive through the south of Perth, the familiar landscape of Australian suburbia made strange by little details: unusual markings on street signage, and pedestrian crossings paved with unexpected materials. The three houses on our itinerary were modest in scale. Weighing in at a tiny 20sqm, Stejskal’s Bellevue Terrace was the smallest, a dining room and bathroom extension that has left the front of the house untouched. Despite its small size, it was ambitious in its execution. Three of the dining room’s four walls opened out or up or across to reveal glimpses of the sky and surrounding gardens, and provide shielded ventilation for Perth’s hot summer months. Vernacular materials and off-the-shelf door hardware were used economically to achieve deft complexity. The overall effect put us in mind of a child’s playbox, supersized to an adult’s scale. This clever use of basic materials was a strategy present in all three projects, with weatherboard and cement sheet common. Barr’s Yeovil Crescent was the most experimental, using exposed oriented strand board panels to the walls and ceilings of new living areas. This is a product aimed squarely at the volume builder market, and intended to be lined internally and externally, but Barr capably celebrated it for its structural efficiency and rough beauty. The projects also shared what we expect is a language particular to Perth, or at least to a latitude more forgiving than our native Melbourne. There was a lightness and thinness to their materiality, and looseness to their construction. Barr’s Beach Road comprised a lightwell and staircase clad in translucent plastic, timber framed walls unlined on one side. The plastic was detailed simply and the exposed timber framing painted white, its noggins perfect shelves for knickknacks and family photos. 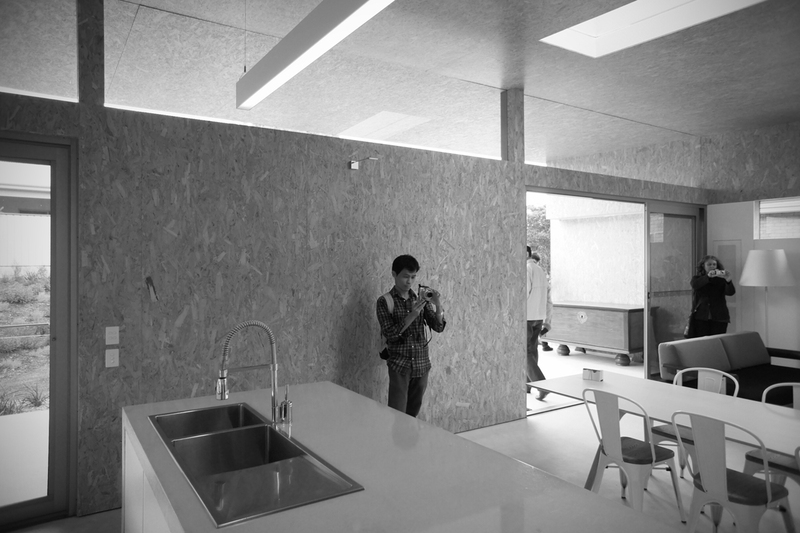 This project also demonstrated an interesting exploration of pocket spaces. The lightwell was the largest of these, but the idea was carried all the way through to window apertures in bedrooms, triangular day beds in living spaces, and joinery nooks in the kitchen. This house was creatively designed, its modest scale acknowledging the legacy of the fibro shack and beach hut, as much of its place as they. What struck us most about all three houses was their resourcefulness, perhaps most evident in Stejskal’s tiny extension. It punched far above its diminutive size and modest budget, the charming complexity of its operable skin indicative of an architect enthused about any project, no matter its scope. It was a pleasure to visit such smart local architecture, and a fitting start to an architecture conference that would address questions of resourcefulness, regionalism and social conscience. Great article for a non architect to read and marvel at what architects can do. Thanks for the feedback, Winston, and glad you enjoyed it.